Published by the Canadian Information Centre for International Credentials (CICIC), this report introduces a set of best practices and guidelines that can be used by organizations to put in place an alternative qualifications-assessment procedure without access to verifiable documentation. Such a procedure could be made available to refugees and those in refugee-like situations who may not have access to the documentation normally required for these procedures. This report describes the findings from a feasibility study on establishing pan-Canadian centres for the assessment of the credential of internationally educated teachers (IETs). The study developed summary profiles for each Canadian province and territory, identifying commonalities and differences in the current processes and practices for IET credential assessment across Canada and evaluated best practices in other contexts of credential assessment. It then drew upon previous reports, as well as focus groups, to synthesize its findings into a proposed model for the country. 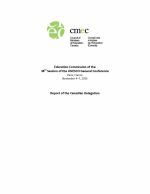 The study was designed to provide recommendations for a pan-Canadian method of assessing the credentials of IETs. This report contains the main outcomes of the 37th Session of the UNESCO General Conference held in November 2013, along with interventions by the Canadian delegation at the Education Commission. The 37th session focused on a variety of issues, including the 2014-17 budget for the commission, Education beyond 2015, the potential global standard-setting instrument on the recognition of higher-education qualifications, and the United Nations Decade of Education for Sustainable Development post-2014 – Global Action Programme. This report describes the findings from a series of six focus groups conducted throughout Canada to identify the barriers to certification and workforce integration of internationally educated teachers. The focus groups examined four specific stages of the integration process: the preparation prior to coming to Canada, the process of obtaining teaching licences in a given province or territory, the experience of securing a teaching position, and the transition into a provincial or territorial school system. At the meeting of the Council of the Federation in July, 2011, provincial and territorial Premiers endorsed an International Education Marketing Action Plan. The Action Plan identifies opportunities for federal-provincial-territorial collaboration on marketing aiming. In 2008, international students spent $6.5 billion in Canada and created over 83,000 jobs. By 2025, the global demand for international education is predicted to quadruple from 1.8 million to 7.2 million students. This report examines the language competencies that research indicates are important for elementary and secondary teachers in English and French first-language schools to have for effective professional practice and teaching excellence. This report contains the main outcomes of the 36th Session of the UNESCO General Conference held in November 2011, along with interventions by the Canadian delegation. The 36th session focused on a variety of issues, including the 2012-13 budget for the commission, the International Standard Classification of Education (ISCED) statistical tool, the 1993 Recommendation on the Recognition of Studies and Qualifications in Higher Education, and the 1976 Recommendation on the Development of Adult Education. This overview presents information on the governance, structure, financing, roles, credentials, types of institutions, and current issues relating to postsecondary education. The document, which is revised on a regular basis, is supplemented by descriptions of the postsecondary-education system in each jurisdiction.